In EAMCET examination, physics and chemistry questions are allotted 40 marks each out of the overall 160 marks with duration of 180 minutes. At the face of it, EAMCET allots 50 percent of marks to Mathematics, which commands more importance thus. Scoring high on Physics and chemistry significantly increases your chance of scoring 90% in EAMCET. As the saying goes, every penny counts, every run counts and every drop counts, and so does every mark. It is no surprise that one mark can make a difference of hundreds of ranks. So, always attach equal importance to Physics and Chemistry if not more than Mathematics. 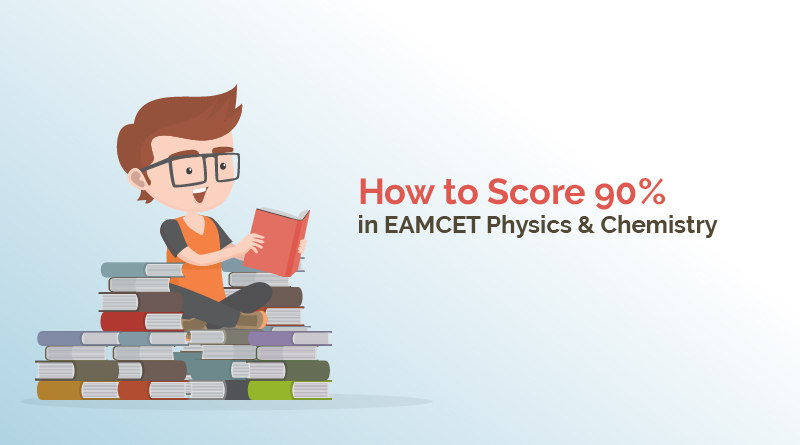 Scoring 90% in EAMCET is not impossible It is important to score 90 percent in both Physics and Chemistry streams so as to stay up in the competition. Let us go through some useful tips and essential measures to gain a foothold on the exam and eventually win over the science streams. Maths yes, but don’t ignore the twosome While you are in your Intermediate, there may have been an unchartered X factor given to Mathematics. You often heard people say that 50 percent of the marks are meant for Mathematics, and thus the stress should be more on the subject. While this cannot be discounted easily, the other two subjects too find a strong foundation only at the Intermediate stage. So, first two years before EAMCET, keep an open mind to respect Physics and Chemistry and consider them to be scoring areas in the entrance. Always approach the subjects with EAMCET on mind. Identify extremely important subjects and cross check with the faculty and seniors. What is important is the questions weightage subjects have in EAMCET. This helps! Subjects such as Ray Optics, Modern, semi-conductors, heat and thermodynamics, laws of motion, gravitation, oscillations and waves may be highly important when it comes to representation in the examination. Similarly, Organic Chemistry, Chemical bonding, Organic compounds, Electro chemistry, Atomic Structures may be crucial in Chemistry. Identify the university conducting the examination and understand the trends of questions set by the university for the previous years. Though this is unpredictable and tricky, there is hardly any wrong in being on the safe side. If you want to score 90% in EAMCET, you have to attempt the paper very strategically. During the examination, if you think Physics and Chemistry can be cleared faster, attempt them first. Mathematics being more calculations-driven may need healthy time. Even in these subjects, always attempt obvious answers first and then have ample time for analytical type. Chemistry is comparatively faster, so attempt it first. No one said EAMCET is easy. Formal training and planned preparation definitely helps and increases your chance of scoring 90% in EAMCET. Sri Chaitanya is one of the best Long Term EAMCET Coaching centers in India. Sri Chaitanya invites you to seek more assistance, guidance and comprehensive preparation for EAMCET with a justifiable focus on Physics and Chemistry. We are among the earliest and the most successful of the EAMCET Long Term Coaching Centres in Hyderabad as well as AP and Telangana. While you browse through EAMCET Long Term Coaching Centers in Hyderabad or any other place in Telugu states, focus on the prominence they attach to the subjects on par with Mathematics. With Sri Chaitanya Engineering Coaching Classes, the methodology has been duly balanced with a vision to optimize concentration on all subjects. Sri Chaitanya Engineering coaching classes unlike several EAMCET Long Term Coaching Centers in Hyderabad is committed to providing crucial learning curve and tips, ultimately to garner 90 percent in Physics and Chemistry.